My Plans For Today Are Getting A Haircut And Not Much Else. What Are You Doing Today? It's The Open Thread! My hair is getting pretty shaggy so it’s well past time to get it trimmed up. 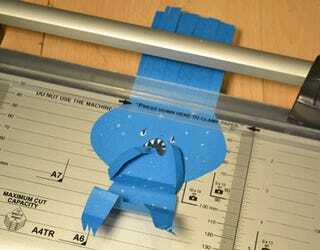 I don’t think I’ll go for the flat top look like this little blue fellow, but being done in one swipe would be nice. After that I may enjoy the bright sunlight and spend some time doing something outside since the last week has been best described by this picture. Later on today when it gets dark, I think I’m going to keep working my way through the first season of the Expanse. I heard good things about it but never caught it on Sy-Fy, so now I’m trying to catch up while it’s first season is on Amazon Prime before season two gets aired in February. How’s O-Deck spending it’s day? Got something to share? Need to blow off some steam? Got a topic you want to talk about? It’s your Open Thread!